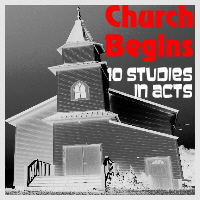 Today we go back to the beginning of Acts 6. So far in the book of Acts, we can see that the Church has come under attack by the world (through persecution) and satan (through deceit & moral compromise). A new crisis has appeared. Unable to destroy the church by way of persecution and deceit, satan now tries to create a split in the church by getting believers to argue and fight with each other. If satan had succeeded in creating an implosion within this church, the only church in existence at the time, then the effects could have been devastating. I have had people tell me they want a church without any form of organizational structure. If a church has no organizational and leadership structure then it will soon have chaos instead of harmony, and will collapse rather than grow. Of course, some leaders are corrupt or make wrong decisions as we have seen already, but Godly leaders will not be corrupt and as we shall see, make decisions that are wise and based on prayer and spiritual insights. So, what was the problem, what was the solution and what happened after it was resolved? Good news - they were growing, but this had caused a problem! Bad news - Some widows were not being cared for! Hebraic Jews had always lived in the then nation of Israel, spoke mainly Aramaic and some Hebraic. They would have been well used to life in a Jewish society, the Temple and avoiding those who were not Jews: the Gentiles..
Grecian or Hellenestic Jews were part of the Jewish Diaspora, born elsewhere within the known world and had returned to Jerusalem. These mainly spoke Greek, and were well used to working with Gentiles. We know that widows were and are important to God, because justice is important to God. God is a God of justice and mercy. In the Old Testament, under the Law of Moses, God commanded provision for those who were widows, oppressed or uncared for. The Apostles would have known about God caring for the widows and in Jesus teaching about justice for the poor and the oppressed. We know this because earlier in Acts 2 and 4, people were selling and sharing possessions and ensuring that people within the Christian community were being looked after and cared for. This included making sure that everyone got fed, particularly those who had no family to care for them. Somehow, unintentional or not, this group of widows were missing out. The twelve summoned the multitude of the disciples and said, "It is not appropriate for us to forsake the word of God and serve tables. Therefore select from among you, brothers, seven men of good report, full of the Holy Spirit and of wisdom, whom we may appoint over this business. But we will continue steadfastly in prayer and in the ministry of the word." These words pleased the whole multitude. They chose Stephen, a man full of faith and of the Holy Spirit, Philip, Prochorus, Nicanor, Timon, Parmenas, and Nicolaus, a proselyte of Antioch; whom they set before the apostles. When they had prayed, they laid their hands on them. Its not stated here, but a transformation had taken place! Only a few short time ago, the disciples of Jesus had refused to wash feet as an act of service (Peter); some had wanted positions of power and greatness (James & John). Their old nature must have started asking questions and prompting them to react negatively. The world has attacked the church, satan has attacked the church, and now satan would have been using the Apostles old nature to attack the church. But - as they are transformed by the indwelling Holy Spirit and now have a new nature, the nature of Jesus Christ, they react much more righteously and judiciously. Notice they gathered all the believers together for a church meeting. The gave their opinion or judgment if you like, that their ministry or time would be better spent doing what God had called them to do - to be leaders of the Church, praying, preaching, evangelizing and discerning how best to apply the 3 years of teaching that they had had when travelling with Jesus Christ before His ascension. Their time, rightly so, was best spent doing that, for that was their ministry of service. But other people in the church gathering, who had a ministry of service and overseeing the food distribution, could spend their time doing that! So what of these seven men with Greek names? They were elected by the whole church, both Grecian and Hebraic, to perform this duty. They may already have been doing it, but now were being set apart especially for this role. These men were controlled by the Holy Spirit and were wise. They were chosen to give relief to the leadership so that the Word of God and prayer would not be hindered. Interestingly enough, the word diakonia is translated here as ministry. Another way to translate it is as deacons. But, they were not deacons in the way the Paul uses the word as part of a church government in 1 Timothy 3. Rather they were deacons, set apart for this specific task - it was their ministry. It may well have been from here, that Paul developed what some parts of the universal church understands of the role of deacons. So these seven men, were prototypes as it were, for the Paul-ine idea of deacons. Note also that the Apostles didn't say their work was more important than serving. They were just following what God had called them to do, just as God had called these seven men to take responsibility for providing food for the widows. So they were commissioned by God, by the laying on of hands and set apart to perform it. We know only of Steven and Phillip and that they continued doing other ministries as well as this. The result was growth! Growth and witness may well see the conversion of former enemies. Growth and witness may well see reasoning and transformation. This growth was where the word of God increased in its effectiveness in the lives of those unbelievers who would listen to the gospel. This growth was not merely addition but multiplication! It was explosive! So explosive that even former enemies were becoming converts! Sadducees were Jewish believers who didn't believe in a bodily resurrection - yet they came to faith and started to believe in the bodily resurrection of Jesus Christ. It's not hard to imagine that some of those Priests coming to faith in Jesus Christ were former persecutors of the Church! They were watching the church to see how best to attack and debate them. Yet found that they were joining the church, rather than continuing to oppose it. The church was preaching one thing and acting upon it. There was no hypocrisy within the church. The church was transparent - it lived as it believed. The church was seen as transformative and servant-like. While the Church continued to reason with others about the validity of Jesus Christ's claims to be the Messiah, it would have not been effective if lives were not being transformed. If lives were not being changed, then no amount of reasoning alone would have seen the growth in numbers being added to the Church. Just as transformation and change alone would not have been the catalyst for growth, without the reasoning behind it. The early Church was a radical community of believers, growing quickly. At Pentecost, the church community began when the Holy Spirit filled the Disciples (Acts 2v4). The hallmarks of this community were commitment and transformation. This community was radical. It was where people's lives were being changed as the Holy Spirit filled them. Instead of being a withdrawn people filled with fear of retribution from the Roman government and Jewish leaders, they became a people filled with boldness and joy. This church in Jerusalem grew by being a radical community imbued with radical individuals engaging with others and serving. It was a church where every member was asked and expected to play some role, in the life of the church. . The Christian life is to be dynamic and active. As we have seen the word "deacon" here denotes ministry. Ministry is any service for Jesus Christ. When you serve as God's deacon in this way, God's honour is released. That's why the embryonic Church in Jerusalem grew and flourished. This is done because service shows the beauty and glory of Jesus Christ to those being served and to those watching. That is to be our motive for service. Serving and ministry should never to be about what you and I can get out of it. When that is the motive, God is not glorified. God's glory and supremacy is our goal as Christians. Spiritual growth comes from serving rather than being served. This is because what ever is given in service of God and others, faith grows and Jesus Christ gives back even more. Jesus speaking in Matthew 25v15-30 tells of the rewards for faithful service and the penalties for being faithless. Serving others is a sign that you are trusting God and having faith in God. Serving God and others is the mark of a spiritually maturity and through service, the greatest servant of all, is reflected: Jesus Christ, who came to serve and give his very life for others (Mark 10v45). As Christians, we are to be as Jesus Christ (Romans 8v28; Philippians 2v5) and to serve. Yet if we are honest, we sometimes feel incapable, just as Moses did (Exodus 3). An excellent example to follow is that of the deacon Stephen.